This 8-week program will run from July 6, 2017 until August 31, 2017, Monday through Friday, 8:00 a.m. – 3:00 p.m. (with Fridays being a half-day), and consist of field trips, garden activities, community service, and so much more. The purpose is to provide an interdisciplinary approach towards learning. Through this process, we believe individuals will become more informed about their environment, and therefore, more likely to have a holistic understanding of themselves and the world they inhabit. Under the supervision of Tobias A. Fox, Founder and Managing Director of Newark Science and Sustainability, Inc., six underserved, well and abled residents throughout the Newark region as young as 14 years old will become more exposed to cultural or worldly experiences. Participants will meet Mr. Fox at the Garden of Hope, 8:00 a.m., Monday through Friday. They will get to take in the beauty gardens offer before starting their day. Each day will be a pre-planned schedule of activities that includes acts of community service, field trips, workshops, and a series of outdoor/indoor hands-on experiences. Lunch will be provided. With the exception of Friday, the day will end at 3:00 p.m. with each participant being picked up from the Garden of Hope. 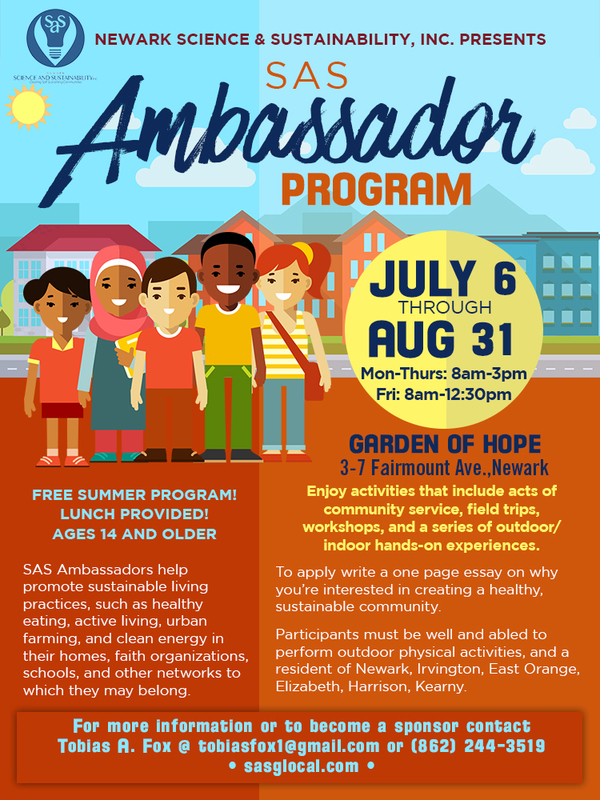 Fridays will end at 12:30 p.m.
Those who actively participate in Newark SAS programs/events and emerge as leaders will be acknowledged as SAS Ambassadors to help promote healthy eating, active living, urban farming, and renewable energy practices in their homes, faith organizations, schools, and other networks to which they may belong. The participant will be awarded a certificate and acknowledged as an SAS Ambassador, and receive ongoing support and training from Newark SAS. This support also includes a letter of recommendation to education institutions and employment opportunities. To apply and receive a full scholarship, participants must be an Essex County resident of Newark, Irvington, East Orange, Elizabeth, Kearny or Harrison, be well and abled to perform outdoor physical activities, and write a one page essay on why they should be selected to participate in this program. Posted in Blog, Community Gardening, Glocal, Renewable Energy, Sustainability, Urban Agriculture.